Bernd and Hilla Becher's almost fifty-year collaboration constitutes the most important project in objective and conceptual photography today. With this volume, grain elevators join the list of building types documented by the Bechers in their book-length studies: water towers, blast furnaces, gas tanks, oil tanks, mineheads, frame houses, and cooling towers. Grain elevators are towering structures in the flat, vast landscape of the world's granaries. Providing a fast and efficient method of loading and unloading grain to keep pace with the industrial production methods of the nineteenth century, they made possible a tremendous increase in the trafficking and processing of grain. Scooping, pouring, and spitting, they both illustrated and inspired Le Corbusier's idea of buildings as functioning machines. Monumental, essential, and visually arresting, grain elevators belong as much to the American imagination and landscape as to the European. 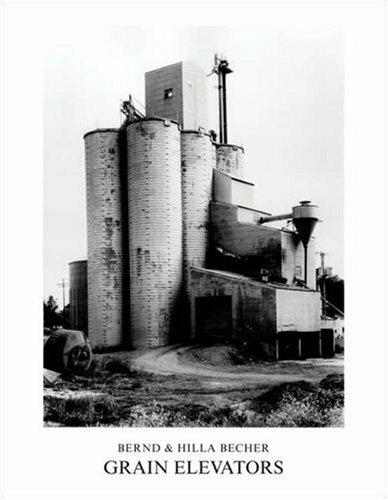 The photographs of grain elevators in this volume were taken in Germany, Belgium, France, and America. But the specificity of time and place is erased in these photographs; the monolithic structures evoke the agricultural prosperity of a vanished era and the vacancy that replaces it today. Bernd and Hilla Becher have collaborated since 1959. Founders of the internationally acclaimed Becher class at the Dusseldorf Art Academy, they have received numerous awards, including the Golden Lion at the 1990 Venice Biennale and the 2002 Erasmus Award. Bernd Becher retired as Professor at the Düsseldorf Academy of Art in 1999.